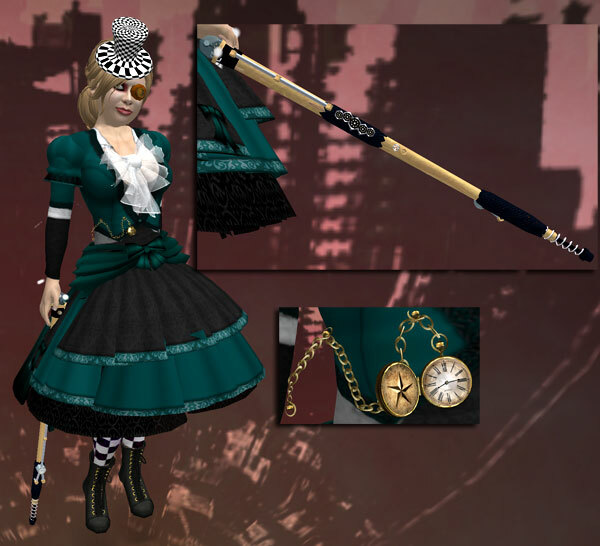 So I’m wandering around Grim Dolls, minding my own business and idly wondering what I’m going to be for Halloween when I find this hat and tights. Don’t ask me why the Mad Hatter came to mind but he did. I did some research and came across the steampunk Mad Hatter from the video game and a costume was born. Silent Sparrow supplied the dress. This review provided the blouse with the necessary bow. I found the man’s pocket watch at the Genesis booth at the Jewelry Expo. The eye came from Mayfair Aviation and the cane with puffs of steam floating out was made by Khjeph777 Enoch. Second Life is the perfect place if you love Halloween, there are always a number of creators putting out imaginative stuff to celebrate with. My hat was a freebie from Curious Kitties, my earrings were also a freebie from Kat’s Meow. The stockings and top came from Nyte N’ Day’s apple bob. The t’shirt says “I’m the Spooky one.” The broom is available at Metemorphoses and comes with several still poses. The name of this new skin from Fleur. I’m not usually a blush person but I went nuts for this set. The dress is new from MichaMi And the jewelry comes from Persona. The long and short necklaces are separate sets but I like them together. You are currently viewing the archives for October, 2008 at SL Fashion Notes.